Since the early 1990s, garage door openers have been required to include several safety mechanisms. These safety precautions are intended to protect against injury and property destruction. The sensors detect objects in the path of the door closing and will not permit the door to shut properly. Despite protections in place to prevent the security system from failing, garage door openers can be bypassed. In the majority of cases, a photo eye sensor will be installed on the garage door sensor. The purpose of a photo eye sensor is to detect if anything is blocking the path of the garage door. Photo eye sensors detect objects as well as people. An infrared light runs between two photo eyes. 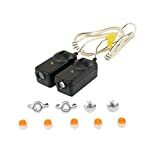 If the light is blocked and doesn’t run without interruption between each eye, then the sensor will not operate and the garage door remains open. If the area is clear, a track and pulley system lifts and lowers the garage door after you touch the remote. By simply moving one of the photo eye sensors, a garage door opener will not operate properly. Damaging a photo eye sensor will also cause an opener to fail. The photo eye sensor for a garage door opener is typically placed approximately two inches off of the ground. If one of the photo eye sensors are malfunctioning, it will begin to blink rapidly. Since most photo eye sensors are placed at that two-inch height, most people know you can simply step high above the infrared light to bypass the system. The garage door will continue to close if your steps avoid the photo eye sensor. Unfortunately, faulty garage door sensors typically need replacement. Otherwise, the garage door will not open or close remotely. For home safety reasons, you will want to get this issue resolved quickly. Until the sensor is working properly, disconnect the unit and operate the garage door manually. It is very important to secure the garage door if a sensor fails. Most garage doors with openers don’t have manual locks in place. If you’re handy, replace the garage door opener on your own. Aftermarket openers are available at most home improvement stores such as Sears, Lowe’s and Home Depot sensor lights. Professional installation may be an option if you’ve never installed a garage door opener before. Garages can be a security risk and should be monitored with security equipment pieces. For instance, some homeowners may decide to install an indoor home security camera if they store any valuables within their garages. 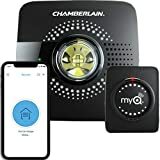 Interested in home security products? Contact Protect America to learn more about how they can keep your home and any outdoor structures safe. Go online today to receive a free no-obligation quote.